Envirosafe Ireland supplies bespoke stainless steel storage units, which are available in a wide range of size and types to suit all tasks. Units are made of fully welded 304 grade stainless steel, and have a brushed dull polish finish. To eliminate any possibility of cross contamination our stainless steel furniture and equipment are non particle shedding. Trolleys come with a variety of unique features such as quiet wheels and sound-absorbing shelves. 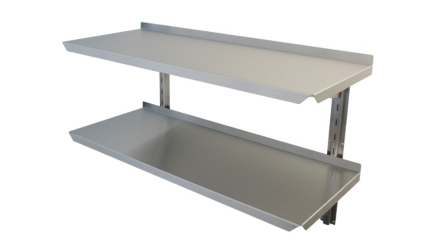 Each shelf holds 40 kg, heavy duty payloads up to 200 kg available. All our stainless steel products are made from fully welded 304-grade stainless steel. 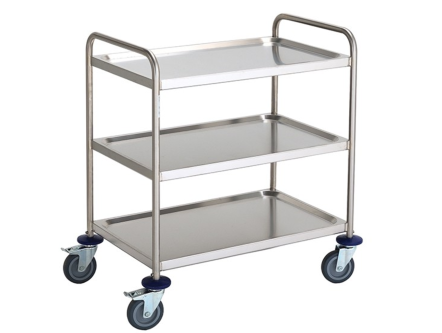 A verity of different trolleys are available to suit individual needs. .
We supply a range of hygienic, ingress-free 304-grade stainless steel modular shelving. 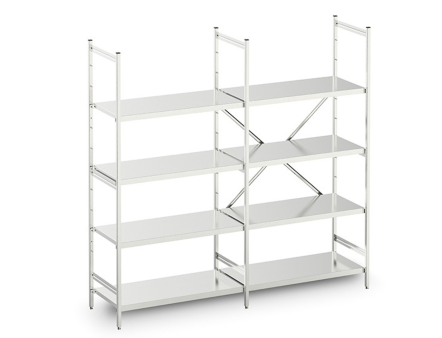 Supplied with 4 shelves, maximum capacity 12, place the shelves where you want – supporting points are 150 mm apart. Payload 600 kg per unit up to 1000 mm wide (with a mad load of 150 kg per shelf). Payload 400 kg per unit over 1200 mm wide (with a max load of 100 kg per shelf). Payload 140 kg per unit for mobile option. 4 adjustable leveling feet for perfect height and balance. A verity of different shelving units are available to suit individual needs. Need a sturdy yet flexible shelving system? Our 1.5 mm thick 304-grade stainless steel shelves are easy to mount and even easier to adjust with spacing every 30 mm. Solid, perforated or bar options available. We provide a range of tough, easy to clean, stainless steel cupboards for you storing needs. Robust 1.5 thick stainless steel set in a super strong frame customisable shelf options. 15 mm points for shelf height adjustment. 4 adjustable stainless steel feet with non-marking rubber bases to ensure level surface. 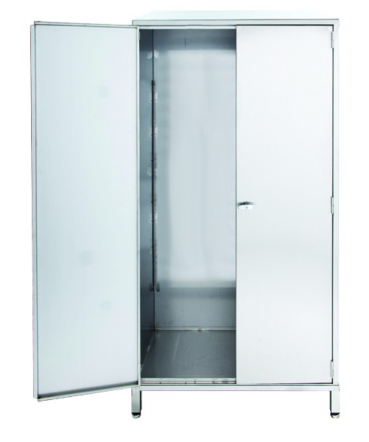 A verity of different cupboard units are available to suit individual needs.